Comes with 30 parts including plastic Tail Cone, Pitot tube, Belly Tube and its nose cone and antennas. 2 sets of laser-cut fins and two sheets of water-slide decals are included. Colorful instructions and 2 decal placement schemes are provided. 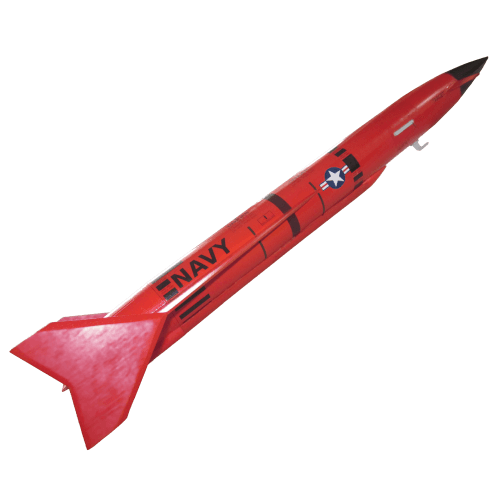 This is a 1/8 scale model of the Jayhawk AQM-37C target drone, which has been in operation since 1961. These target drones can travel at great speed and are used to simulate a variety of realistic threat scenarios. 3 types of glue used to build this model. For that true scale looking fins the Jayhawk fins must be tapered. There are a lot of decals, which will take a lot of time to apply. Motor Retainer cannot be installed on this model unless it is selected at the time of purchase because it requires a different version of the tailcone. Click the checkbox above to include 24mm Aluminum Retainer.